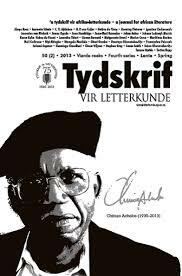 Tydskrif vir Letterkunde (TL), a journal for African Literature, celebrates its 80th anniversary in September 2016. The editorial collective in conjunction with the Southern Modernities Project at the University of Pretoria issue the following Call for Papers: “African and Diasporan African Literature: Imaginings, Modernities and Visions”. At the turn of the century, the former South African President Thabo Mbeki promoted the 21st century as the “African century”, a grand vision based inter alia on the prospects of Pan-Africanism, modernising (even globalising) African economies, and the homogenisation of African cultures. Fifteen years into the new century, little is heard of Mbeki’s envisaged African Renaissance, and in the contemporary imagination the African continent remains characterised by images of horror, disease, poverty and corruption. These dystopian visions are often juxtaposed with the stereotypes of the continent’s natural beauty, political dissidence and courage. Amidst it all, are the social, cultural, political and economic endeavours of Africans who are changing their societies in ways that could not have been conceived eighty years ago, when the immediate predecessor of Tydskrif vir Letterkunde was established. This Call for Papers is kept deliberately broad to allow participants to reflect critically on the various journeys African writers and cultural practitioners on the continent and in the Diaspora have travelled, and the ways in which they imagined their futures. Indigeneity, modernity, hybridity, diversity: e.g. the relationship of indigenous language writers to metropolitan language production practices; orality and contemporary modes of transmission and recording; genre adaptation and innovation in African literature. Gender: e.g. the emergence of women writers in contemporary African literature; the thematics of gender relationships; the place of gay, transsexual and gender politics in African literature. Dissidence, resistance, justice and freedom: e.g. have the abiding themes of justice and freedom evolved since the mid-twentieth century and what are the future social, economic and political struggles foreshadowed in African literature? ; the rewriting of older themes of leadership and corruption, authenticity and foreignness, genocide, violence, etc. Nation, transnationalism, globalism: e.g. nation-building; myth and nation; continental and global integration, etc. Imagination, desire, ethics: e.g. the shaping of imagination in Africa; is there a failure of moral imagination in African letters? ; the ethics and aesthetics of interacting with African locales, people and the environment; personal and communal imaginations. Themes of comparison between regional literatures, literary traditions, genre and literary expression. Paper proposals for this conference of no longer than 300 words are hereby invited. The allotted time for an individual presentation is 20 minutes with a 10 minute period set aside for questions and discussion. DUE DATE FOR 2ND ROUND OF PROPOSALS: 30 May 2016. Please note that the working language of the conference will be English. 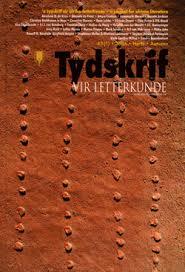 Articles accepted for publication in the subsequent conference issue of Tydskrif vir Letterkunde may be submitted in Afrikaans, Dutch, English or French. Updates on the conference will be posted on our Facebook page , and participants are invited to follow us #TLSM2016 on Twitter. Tydskrif vir Letterkunde Editorial Committee: Chiji Akoma (Villanova U), Willie Burger (U Pretoria), Magreet de Lange (U Urecht), Isidore Diala (Imo State U), Muhammed Haron (U Botswana), Kasongo Kapanga (Richmond U), Tercia Klopper (U Pretoria), Lesibana Rafapa (Unisa), Jessica Murray (Unisa), Antoinette Tidjani Alou (U Abdou Moumoni), Jacomien van Niekerk (U Pretoria), Andries Visagie (U Stellenbosch), Alex Wanjala (U Kenya), Hein Willemse (U Pretoria).